David Dewey is an artist who has been painting for more than 30 years. He has had his artworks exhibited throughout the USA in museums. This book is the reprint edition of the original one that was published in 1995. 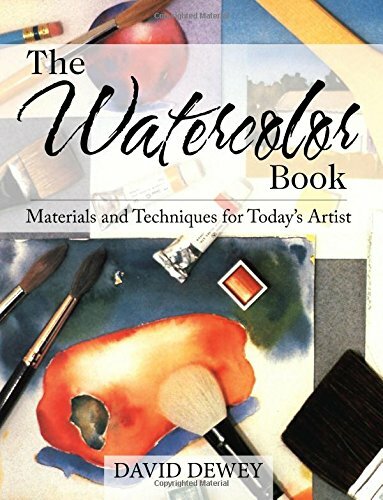 The tips and techniques taught are timeless and this is still a good book for any watercolour beginner. Assuming no prior knowledge, the book covers the materials and tools, basic skills, techniques, colour theory and mixing, different subject matter and mixed media work. For basic skills, it starts with actually teaching you how to draw, understanding light and dark, negative space and composition. This way, you can draw your own subjects to colour later on. The techniques and subject painting sections are taught with step-by-step demonstrations that are easy to follow. The instructions are clear and concise, informative and insightful. Dewey's personal paintings as examples are very beautiful. The chapter on colour theory is also interesting. It talks about the different colour schemes, some colour mixing techniques, and has nice examples. It's a rather comprehensive watercolour instructional book. It can get technical at times because the writeup is quite in depth. If you want something more elementary, check out You Can Paint Vibrant Watercolors in Twelve Easy Lessons or Watercolour for the Absolute Beginner.